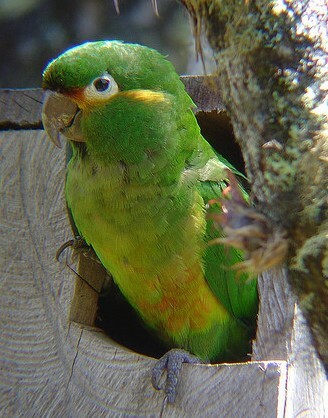 The project for threatened parrots that is currently being carried out in the Colombian Central Cordillera is a preservation initiative that started to be implemented in 2003 so as to tackle the threats that some species were facing, notably Fuertes’s Parrot, critically endangered endemic species; Rofous-fronted Parakeet, endangered endemic species, Rusty-faced Parrot and Golden-plumed Parakeet, both fall within the category of vulnerable species. The project aims to monitor the herds of these bird species, to strengthen the Artificial Nests Program including the long-term monitoring of young individuals, to implement the campaign Adopt a nest within the artificial nests programme. Italso aims to strengthen environmental education initiatives within the local community like the students of the Bird Friends Ecological Group or the groups of local leaders interested in preservation issues. Another initiative within this project is the expansion of knowledge regarding the preservation of different endangered bird species thanks to the Parrot Bus, a mobile environmental education classroom. Spectacular photos were taken of the Rusty-faced Parrot consuming minerals from cliffs in Dusky Starfrontled bird reserve. 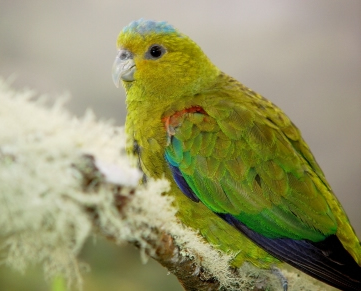 This type of activity is not well known for this species or Andean parrots.